THE LIGHTEST AUTOMATIC CHRONOGRAPH IN THE WORLD. Streamlined design and the use of Titanium, Fortal® HR, Makrolon® and Inox 316 result in a new weight record of just 48.80 grams (1.72 oz). It took BRM more than two years to reach the impossible goal of creating a chronograph weighing less than 50 grams without sacrificing the reliability required of a BRM timepiece. Weight reduction plays a major role in BRM’s technological achievement. Operating with the precision of a Formula One team, the BRM engineers have eliminated every bit of extraneous weight in the design and manufacture of the MK-44, using micrometric scales to enhance precision and efficiency. The case is created in Makrolon®, the extra-light material used for the side windows in the most advanced race cars. The back is made of Fortal® HR, an extra-light aluminum alloy that is frequently employed in motorsports. Putting this remarkable weight-reduction program into perspective, the BRM MK-44 weighs a mere 48.80 grams (1.72 oz), whereas a similar chronograph has a weight of 100 grams (3.5 oz) or more! 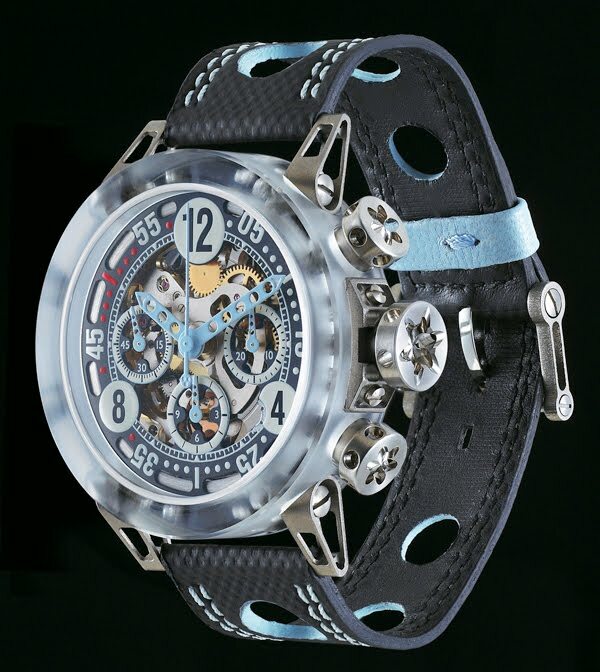 The result is a new world record for the lightest automatic chronograph.